Motor Sich is to produce engines for the new aircraft. The state-owned company Antonov has received an order from the Armed Forces of Ukraine on the development of a combat aircraft, Ukrinform reported with a reference to a high-ranking defence ministry officer. "We have a contract for the for the production of a combat aircraft. In particular, the executor of the project will be the Antonov company. It is expected that the engines will be produced by the Motor Sich," the deputy chief of armaments of the Armed Forces of Ukraine Col. Vladyslav Shostak told a briefing on 31 May. Earlier, Antonov had never produced combat aircraft before, concentrating solely on transport, passenger and specialized aircraft. However, in 2014, Antonov's General Designer Dmytro Kiva said in a TV interview that the company has the capacity to produce fighter and attack aircraft. He said Antonov in 2006 officially submitted such proposals to the government, but the proposal was turned down as untimely. "Today, we have again drafted a proposal on this subject. These aircraft will be created with the involvement of Ukrainian enterprises: with Ukrainian-made engines, with Ukrainian equipment, with Ukrainian weapons. That is, we could do it quite effectively. That wouldn't be any worse than, as some suggest, buying aircraft, for example, in China," Kiva assured. In late 2015, it was rumoured that Antonov was working on a combat-training aircraft with AІ-222-25 engines by Motor Sich. In the spring of 2015, the newest Ukrainian aircraft An-178 made its virgin flight. 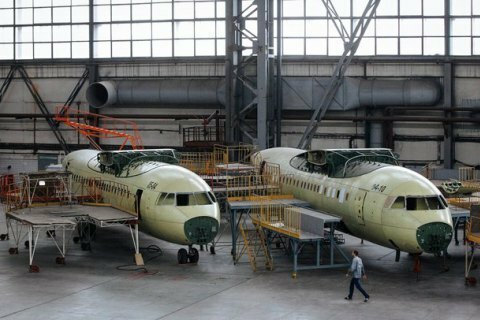 Now works are underway on An-132, an updated version of An-32. Also, Antonov has been developing a dual use transport aircraft for India. Also a deal was signed with Turkey on the development of aircraft on the basis of AN-158, AN-178 and AN-70.